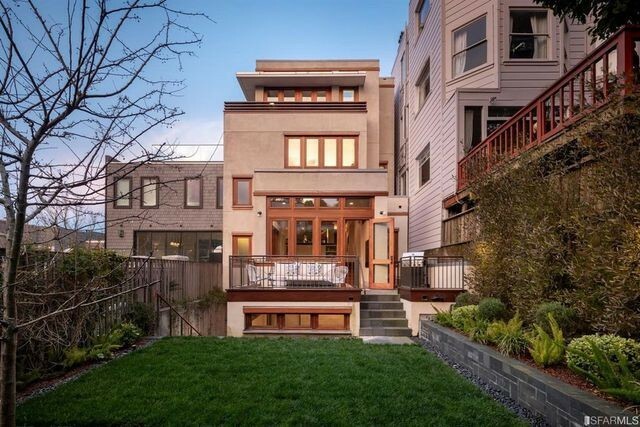 PayPal co-founder Max Levchin has put his San Francisco home on the market for $7.25 million. The Ukrainian-born computer scientist purchased the luxury real estate in 2007 for $5,325,000. Not surprisingly, the online payment guru and his wife have a posh pad. Built in 2003, the multilevel home measures 3,049 square feet and has five bedrooms and five bathrooms. It makes prime use of indoor and outdoor spaces, including an interior courtyard, access to a backyard from the family room, and a wraparound deck with beautiful views. On the main level is a living room with a gray-stone fireplace adjacent to the dining area and a pass-through to the kitchen. The cooking area includes a large island, double ovens, and a breakfast nook. From there, it’s a simple step down to the family room, which opens to the outdoor gardens. The master suite, which takes up the entire top floor, includes a bathroom, walk-in closets, office, and sitting area with access to a wraparound deck. The deck offers views of the San Francisco Bay, the Golden Gate Bridge, and Alcatraz. The other bedrooms are located around an interior courtyard. The layout includes an in-law apartment on the lower level, along with the garage. Located in the upscale Cow Hollow neighborhood, the residence is close to the Presidio park, the Lyon Street Steps, and the shops and restaurants along bustling Chestnut and Union streets. After eBay purchased PayPal, Levchin made a multimillion-dollar fortune. He then turned his attention to other projects—the 43-year-old was a key early investor in the review site Yelp, and founded or co-founded the companies Slide.com, HVF, and Affirm. As of 2014, his net worth was estimated at $300 million.